Through our six monthly maintenance appointments, consisting of a dental examination followed by a cleaning session with the hygienist, we aim to minimise dental disease. Dental radiographs (x-rays) may also be taken at recall appointments to assist in the early diagnosis of dental cavities and gum disease. Early detection is the key along with continuing education and ongoing support and encouragement. Discussions concerning in-house whitening (zoom) and take-home whitening procedures. Fissure sealants are a safe and painless method of protecting the teeth and preventing a cavity from forming in the deep grooves and pits of the teeth, especially the molars. Unlike, a filling, sealants require no drilling or anaesthetic and only take a few minutes to perform. The treatment involves covering the surface of the teeth that are responsible for chewing including deep grooves and pits that can be impossible to clean effectively. These grooves or “fissures” are so deep that microscopically the end of the toothbrush bristle cannot reach these areas making it an ideal place for decay to start up. Fissure seals effectively block the bacteria and food particles from attaching themselves to deeper portions of the fissure thus preventing the decay that ultimately leads to patients requiring a filling. Fissure seals are white in colour and blend seamlessly with the rest of the teeth. Fissure seals are a fantastic preventative measure as not only do they help protect the deeper grooves of the teeth from cavities, they also make it easier to clean those hard to reach places towards the back of the mouth which are often missed. Gingivitis is commonly referred to as “gum inflammation or bleeding gums”. Patients will usually find their gums bleeding easily when brushing or flossing when suffering from gingivitis. It is important to realise that gingivitis is reversible. 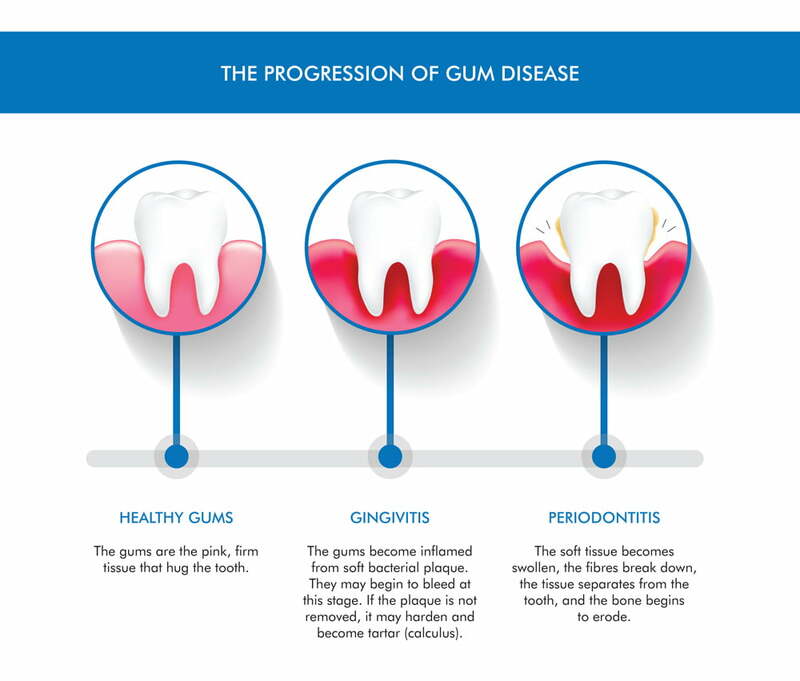 Periodontitis occurs when gingivitis is not properly treated, causing gum inflammation to advance to gum disease or periodontal disease. At this stage destruction of the supporting tissues around the tooth occur ultimately leading to tooth loss if left untreated. 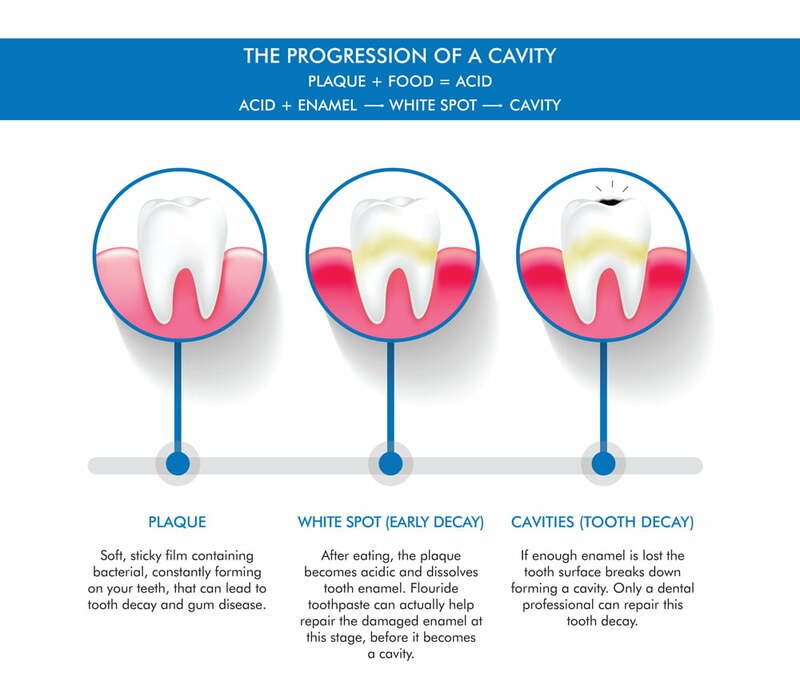 Plaque is the primary cause of gum disease. Poor plaque control from improper brushing and flossing along with infrequent professional cleaning appointments may lead to more advanced problems. Plaque contains bacteria which infects the gum tissue causing the inner layer of the gum and bone to pull away from the teeth and form pockets. These pockets (or spaces) collect and harbour more bacteria and debris which if not cleaned properly become infected, resulting in more tissue destruction. Toxins from the bacteria break down the bone and connective tissue that hold teeth firmly in place. As the disease progresses, the pockets become deeper and more bone and soft tissue is destroyed. To discuss this topic further please give us a call and one of our friendly staff members will help book you a dental appointment. We will be happy to discuss and answer any questions you may have. At Dental Pearls, we aim to prevent advanced gum disease through preventative measures and education. It is imperative to visit the hygienist for regular cleaning session and oral health assessments. For nearly two decades doctors have been discussing the potential link between heart disease and oral health. Heart disease is the nation’s leading cause of death in both men and women. We now have more and more research linking heart disease with chronic gum disease – gingivitis and periodontitis (commonly referred to as gum disease or bone disease). Gum disease, or bleeding gums, can cause bacteria to enter the bloodstream and attach to the fatty deposits in the heart blood vessels. Blood clots can form which may lead to heart attacks. Keeping up your six monthly recommended clean appointment with your hygienist can help prevent gum disease which in effect may help to keep your heart healthy and functioning well. It is also important to know that other factors contribute to gum disease including hormonal changes, illness, medication, and recreational habits such as smoking. Several specific types of bacteria that live in the mouth are the cause of tooth decay. This bacterium uses sugar to create acids that dissolve and attack your teeth and cause an infection. What must I do if I have tooth decay? Unfortunately, tooth decay is permanent damage to your teeth. If left untreated, your tooth decay can erode deeper into your tooth causing damage to your tooth pulp. This could result in the need for root canal of extraction. If you have tooth decay, you should make an appointment as soon as you can with your dentist to help treat the decay. Yes! Tooth decay can be prevented. Avoiding high-sugar foods and maintaining a good oral hygiene routine can help prevent decay. Visiting your dentist regularly will also help to spot and treat early signs of decay before it becomes more aggressive. You can also go the extra mile and schedule regular professional tooth cleanings with a reputable oral hygienist. During your appointment at Dental Pearls, all aspects of preventative dentistry including your predisposition for gum disease will be assessed to determine how best to treat your periodontal condition. For more information on preventative dentistry, or to book an appointment with our team, contact us today.